Learn how to make this summer meal in one dish – without having to stand over a hot grill! Special thanks to my friends at Stubb’s for sponsoring this post. 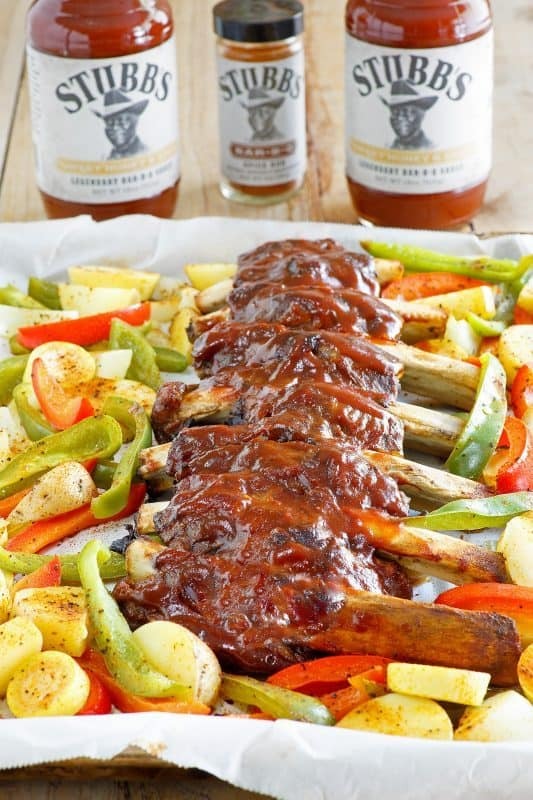 Slow cooked, fall off the bone tender beef ribs coated in a thick layer of legendary Stubbs Sweet Honey and Spice Bar-B-Q sauce, served alongside seasonal veggies for the win! Y’all, I love me some ribs, always have. Growing up, finding out we had ribs meant we were having a feast and to this day there is something about a big rack of them that just makes the day extra special. My husband wasn’t raised eating ribs like I was but my slow cooked method has won him over and now he’s just as much of a fan as I am. With the fourth of July coming up, we’ll be getting together with family and I love to cook for the Jordans. My sister in law and I usually combine forces and divvy up the dishes between us. This year it’s my turn for the main course and Stubb’s Sheet Pan Ribs are on the menu! I have always made my ribs in the oven. With a little know-how it’s easy to mimic the taste of the grill and I’ve never once found myself thinking “It’s 100 degrees outside, I think I’d like to go out there and stand over a fire…” If you’d like to save yourself a little heat induced tribulation this year and still have the flavor an occasion calls for, this is the recipe for you. 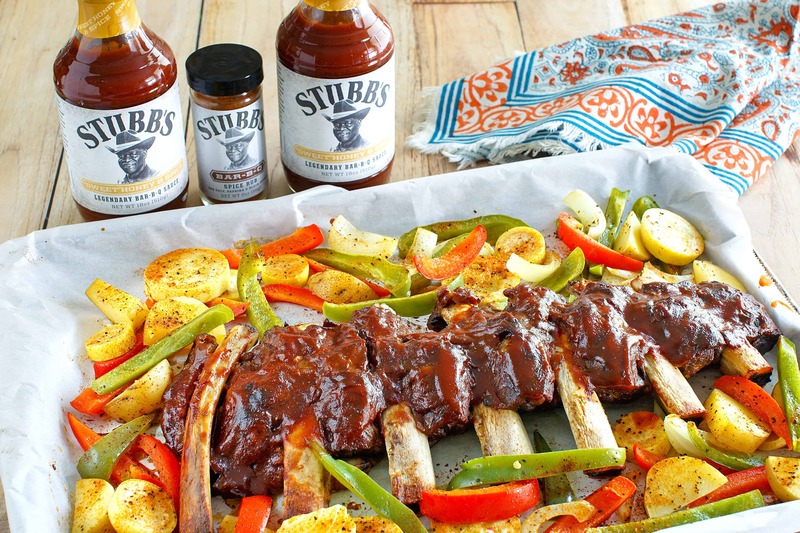 To make this, you’ll need: Stubb’s Sweet Honey & Spice Bar-B-Q Sauce, Stubb’s Bar-B-Q Spice Rub (or kosher salt), a rack of beef ribs, and a few veggies of your choice. Now when you get ready to cook your veggies and thicken your sauce in this, make sure you cut your veggies kinda small so they will get done. And be sure you cook them to your desired doneness, because everyone likes their food like they like their food – and that’s a good thing! 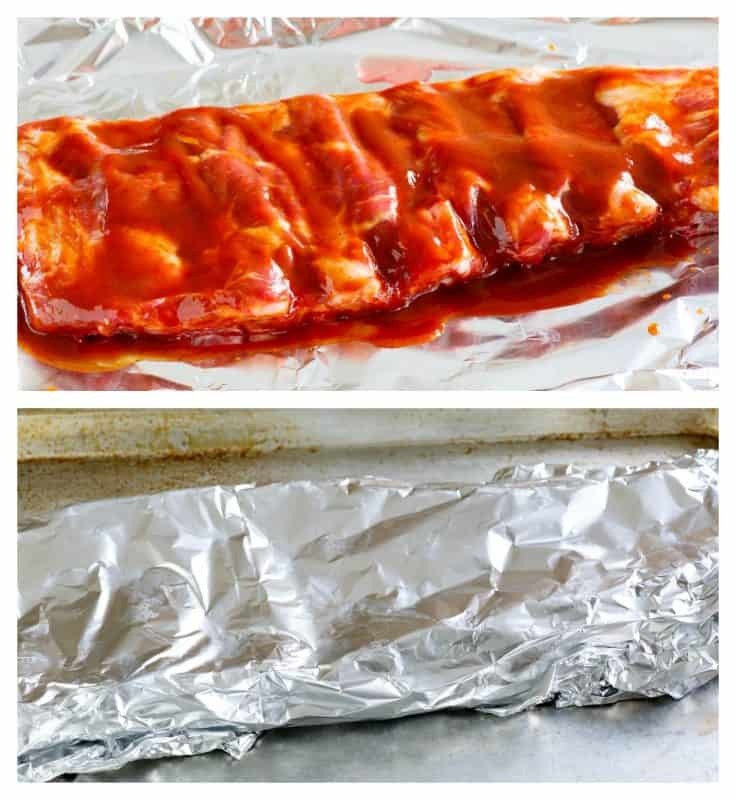 Begin by placing entire rack of ribs on a large piece of foil and brushing with Bar-B-Q sauce. Wrap the rubs up well in the foil and place on a baking sheet. Bake at 300 for two hours. Yes, I said 300 for two hours. I like using Stubb’s in this because it is an easy to find sauce with a slow cooked homemade taste that really stands out from the other bottles on the shelf. This is their 50th anniversary, too. 50 years ago C. B. Stubblefield (known as “Stubb”) opened his original restaurant in Lubbock, Texas. A big part of that menu was his famous rib platter, along with a rib sandwich and ribs by the pound. After two hours, unwrap the ribs and either leave them in the opened foil packet or remove them, either way is fine. Surround them with bite sized cut veggies of your choice. Drizzle the veggies with olive oil and sprinkle them with a seasoning. I like to use Stubb’s Bar-B-Q rub because it complements the sauce on the ribs perfectly, but you can also just give them a nice sprinkling of kosher salt. and give the ribs another generous brushing of Bar-B-Q sauce. Arrange veggies around them and return to the oven for one more hour, or until veggies are desired tenderness, to allow the sauce to really thicken and stick to that delicious rib meat. And this deliciousness is your final product. Have a wonderful fourth of July, and an even better summer! Take it slow when you can and make some memories spending time with friends and family. 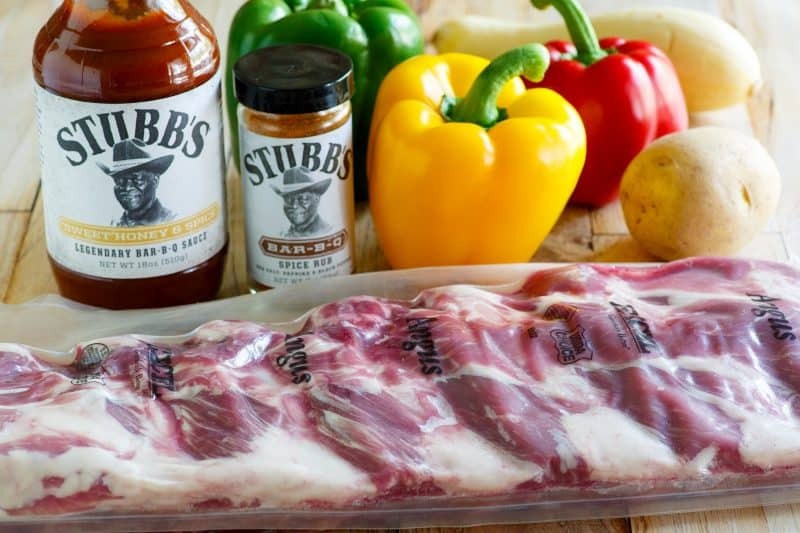 For more information on Stubb’s line of Bar-B-Q Sauces and Seasonings, please click here. For a great appetizer while you’re waiting on the ribs to cook, check out this unique take on Fiesta Layer Dip, Stubb’s Style! Veggies of your choice such as bell pepper, onion, squash, etc. Place rack of ribs on a large piece of heavy foil and brush generously with about 1/2 the bottle of Bar-B-Q sauce. Wrap well in foil and place on a sheet pan (13x18). Place in a 300 degree oven for 2 hours. Remove from oven and open foil packet, being careful of steam. Slice veggies up into bite sized pieces and arrange around opened ribs on baking sheet. Drizzle with olive oil and sprinkle with seasoning (Stubb's Bar-B-Q Rub or Kosher Salt). Open ribs and brush additional sauce onto ribs. Return to oven (Leaving foil that ribs are in open) for another hour to thicken sauce, or until veggies are desired tenderness. This post was generously sponsored by my friends at Stubb’s. Special thanks to them for supporting Southern Plate and helping me bring you more free recipes! All opinions are my own. Great Road Trips – Share Your Ideas! Thank you so much, Aileen! It’s some good stuff, isn’t it? Christy I’ve never cooked ribs in the oven but am going to give this a try! When you put the ribs back in with the veggies, the foil remains open? It sure does! Thank you for asking this. I will go clarify in the recipe. Christy…just wondering why they have to be beef? Thanks! I am famous for your oven ribs recipe! We love them! WOW, that just made my day Lana!!! It does my heart good to hear that you like them and they are a hit with your family and friends. My husband would be very upset with just one rack of ribs. Recipe sound delish. I prepare country ribs in the oven using Foy’s BBQ Sauce and Sweet Baby Ray’s and friends are in shock that you can get great tasting ribs cooked in the oven. Look forward to trying your recipe. I hope you enjoy it Pam! !